The ins and outs of intellectual property law can be a complex minefield if you don't have the right information at your fingertips. If you're selling products or services and want to protect the logo or name that identifies your product, you'll want to register for a trademark. You can't have a licensed mark that you give to other businesses or franchises until you get a trademark. The purpose of a trademark is to protect consumers from confusion when they're purchasing goods or services. You don't want someone buying a product that they think is yours because the logo is similar, only to discover it's of lesser quality. Confusion like this can hurt the customer and hurt your product's value. A trademark protects any mark that identifies your product or service. The mark can be a logo, a name, a phrase or something similar. If you use an original trademark in commerce, you'll automatically have rights to that mark in your region. However, registering your mark with the U.S. Patent and Trademark Office will give you greater protection, along with eligibility for more damages if you sue someone for infringement. A licensed mark is created when the trademark's owner gives someone else a temporary right to use the mark for a specific purpose. The contract for a licensed mark usually includes whether the license is exclusive or nonexclusive and will stipulate restrictions, such as geographic regions where the mark can be used and types of products that can be marketed under the mark. The contract will specify how long the license is for and situations in which the license can be ended early. An important point of trademark law is that if the owner doesn't police the mark and take action against anyone who infringes on it, he may eventually be viewed as abandoning the mark and lose his rights to it. A naked license occurs when the owner doesn't police how a party is using the licensed mark and can result in a finding of abandonment. A trademark owner can avoid this by vigilantly reviewing the licensed owner's use of the mark and making sure he's using it within the confines of the contract. 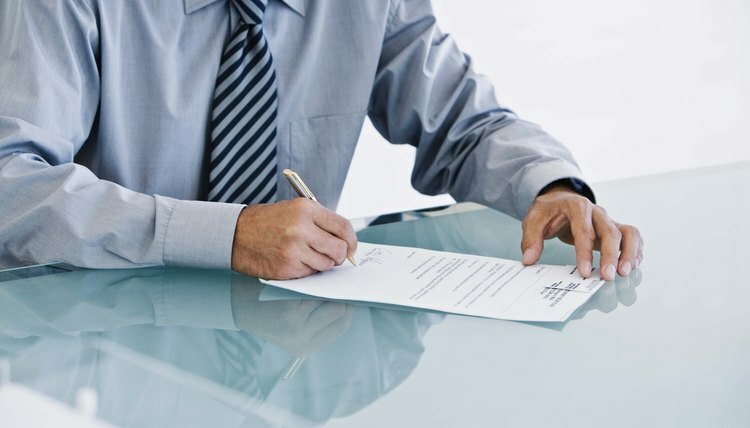 A licensed mark agreement can sometimes be so similar to a franchise agreement that a court will find that the contract created a franchise relationship, resulting in added laws and regulations that must be followed. Franchise agreements involve the right to use a trademark, paying the owner royalties and other fees, and the owner significantly controlling and/or helping the licensee run his business. To avoid this, the contract should stipulate that the owner exerts only enough control to maintain his trademark rights and not over the entire business. The contract should stipulate that inventory won't be purchased above wholesale prices; if royalties are not to be paid, this should also be written out clearly. Because the rules are tricky, it may be helpful to have an online legal document service or attorney draft the licensing contract to ensure maximum protection and clarity.